The continent’s economic infighting also creates a new context for China’s relationships with the three NAFTA countries. Could this moment be the springboard for Beijing’s great leap forward in North America? In Chinese, the word “crisis” is composed of two characters, wei and ji. While wei means “danger,” ji means “opportunity.” For China, U.S. President Donald Trump’s trade wars represent both. During the 2016 presidential campaign, the then-candidate mainly targeted two countries, China and Mexico, blaming them for the U.S. trade deficit, the loss of American jobs, and the exodus of manufacturing, among other things. Since becoming president, Trump has followed through on his threats, pushing a hard line on a new North American Free Trade Act and launching opening tariff volleys against both countries (as well as Canada and the EU). While these battles have garnered much attention in the context of bilateral ties and, in the case of Mexico and Canada, a continental context, less attention has been paid to the new context that has emerged for the relationship between China and the three NAFTA countries. In the face of a changing world trade landscape, Beijing is looking to take advantage of new opportunities brought about by the tumult in North America and extend its fast-developing geo-economic agenda into America’s backyard. “China is really the unspoken fourth partner in NAFTA,” said Enrique Dussel Peters, a Mexican economist and head of the Center for China-Mexico Studies, in an interview with Politico. “China has benefited the most. As Trump talks about Mexico robbing U.S. jobs, he’s really looking at the wrong country – not the right beneficiary,” he added. That striking assessment was made in November, as the fifth round of NAFTA talks concluded in the Mexican capital with little progress made and tensions on the rise. One month earlier, a similar sentiment appeared in Shijie Zhishi (Foreign Affairs), a leading Chinese-language magazine run by the Foreign Ministry. If NAFTA negotiations face gridlock or collapse, write the authors, then China is in a prime position to benefit. Today, the talks haven’t collapsed, but according to some reports, “gridlock” would be a kind description. While Chinese officials have focused their public comments on their own trade tussle with the U.S., this may well be the gist of the Chinese government’s strategic thinking about the North American situation – namely, with trust between Washington and its neighbors at a palpable low, and one of the world’s largest free-trade areas showing signs of possible fracture or weakening, Canada and Mexico will be increasingly eager to diversify their economic partnerships. China, as the world’s second-largest economy and the top exporter, would seem to be an obvious alternative to the U.S., at least in part, for both countries. Could this moment be the springboard for Beijing’s great leap forward in North America? In May, former Mexican President Vicente Fox told Fox Business that the country was formulating a “plan B,” involving China, should NAFTA negotiations fail. 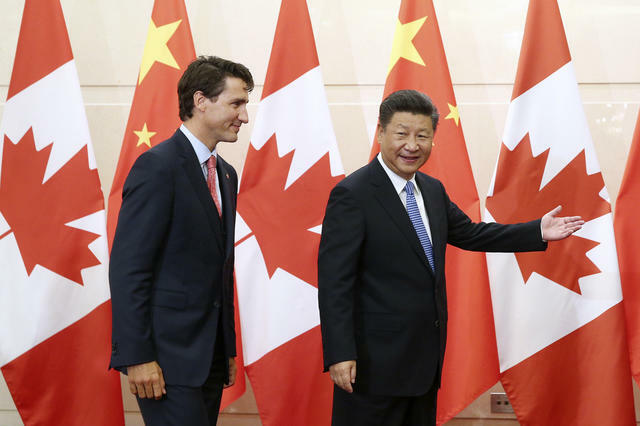 One Washington Post analysis says that especially since Trump entered office, Canada and China have been “playing economic footsie.” Could this moment be the springboard for Beijing’s great leap forward in North America? Surely, China is watching the North American infighting and negotiating with an opportunity-seeking eye. But, of course, the tableau gets more complicated, with more potentialities and more inflections of strategy. Beijing is contending with its own tariff tug-of-war with the United States, or “the largest trade war in economic history,” in China’s words. Initiated by Washington amid a massive trade deficit and deep concerns over intellectual property theft, that war could escalate immensely should the Trump administration follow through on plans to target an additional $200 billion of Chinese goods. The possibility is riling Beijing, whose trade surplus and foreign currency reserves have enabled the government to buy the loyalty of elites and to control and suppress any internal opposition. This situation between the world’s top two economies has North American implications as well. It raises the possibility that Canadian and Mexican products could stand in for some of what was previously imported into China from America. 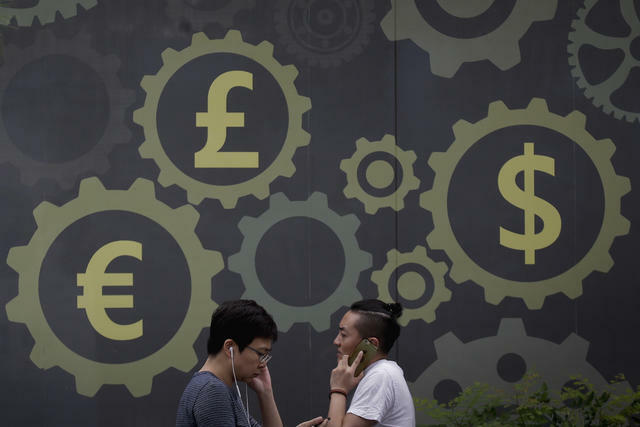 People walk by a mural displaying world currency symbols outside a bank in Beijing, August 6, 2018. For example, China, the world’s top energy consumer and importer, could look to further increase its consumption of Canadian natural resources. The thirsty country represents a critical market opportunity for growing Canadian exports of oil and natural gas, and Ottawa is pushing a pipeline to deliver fossil fuels east (a project that has generated controversy, but which now could become more appealing). In addition, Chinese technology giants are boosting investment in Canadian high-tech, all the more so as political tensions with the U.S. prompt investors to look elsewhere. Underpinning the adjustments that China looks to make in North America is the groundwork that it has already laid. Indeed, Beijing is not unprepared for the openings that it now sees, having begun its campaign in the continent well before Trump took office. While China’s trade with, and investment in, Canada and Mexico have paled in comparison to the U.S., the trend line is decidedly upward. In 2012, Mexican President Enrique Peña Nieto and Chinese President Xi Jinping founded the Grupo de Alto Nivel Empresarial México-China, a partnership between more than 20 major companies, including tech giant Huawei and Aeroméxico airlines, to promote business cooperation. A “Comprehensive Strategic Partnership” followed the next year. This major upgrade of bilateral relations included agreements to increase mutual investment in energy, mining, infrastructure, and high-tech, as well as boost China’s imports. Between 2014 and 2016, Mexico saw more than 40 deals with China valued at over $4 billion, whereas no previous year had seen more than five. Chinese national oil company CNOOC won the rights to develop two deep-water blocks in Mexico’s Perdido Fold Belt in late 2016, as China looks to expand its oil production in North America and elsewhere. Chinese investment in Mexico has already increased four-fold since then. Today, China is Mexico’s third-largest export destination. China is Canada’s second-largest trading partner, after the United States. During Premier Li Keqiang's visit to Ottawa in September 2016, he and Canadian Prime Minister Justin Trudeau vowed to double trade by 2025 and accelerate negotiations on a free-trade agreement. Last year, another meeting between the two resulted in agreement to collaborate further on agriculture, tourism, and student exchanges. According to China’s Commerce Ministry, the total amount of merchandise traded between the two countries reached nearly $73 billion last year, with 15 percent year-on-year growth. A top goal of China’s North America strategy is to eventually sign free-trade agreements with both of the United States’ neighbors. While bringing down tariff barriers means major new opportunities for Chinese exports, Beijing also views such agreements as an effective way to deal with the multilateral trading systems of which it is not a part, such as NAFTA. “If we negotiate a free-trade agreement, this will greatly favor trade exchanges between our two countries. There is no difficulty from China’s side,” Chinese Ambassador to Mexico Qiu Xiaoqi said last year. 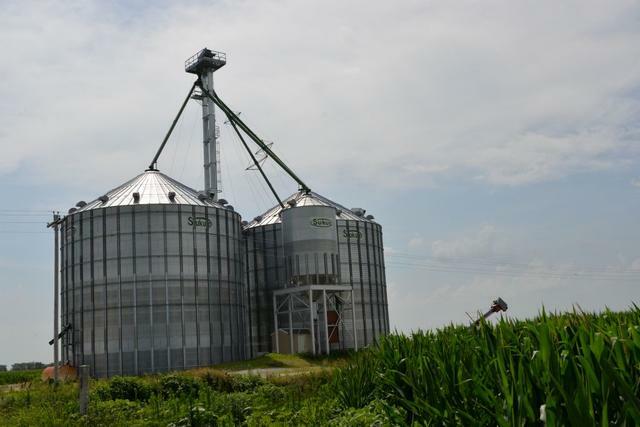 However, even amid the trade tremors rippling through North America and notwithstanding the facts of China’s deepening economic footprint, that goal still faces significant hurdles. Having considered China to be a direct competitor in the North American market, especially as the two compete in providing cheap labor, Mexico was the last country to withdraw objections to Beijing’s WTO accession in 2001. Those tensions linger, and there is concern that any free-trade agreement would cost more Mexican manufacturing jobs and increase the country’s sizable trade imbalance (Mexico imports 14 Chinese products for each one it exports). A Road to North America? China’s piqued interest in North America must also be viewed through a certain lens, or rather, as an extension of a certain road. While China’s rise over the past twenty years has been largely an economic phenomenon, the country’s foreign policy has become bolder, featuring more provocative behavior, since President Xi Jinping assumed and rapidly consolidated power. Trade issues have become especially political. This is evident in the Belt and Road Initiative, often referred to as “China’s Marshall Plan.” Also called “One Belt, One Road,” it promises to build highways, high-speed trains, pipelines, and shipping infrastructure to connect China to countries across Eurasia and North Africa by land and sea. The Chinese government has promised significant financial benefits and development support for participating nations. Xi sees the Initiative as a potent tool to expand China’s influence. While the Belt and Road plan does not include North America, there are links, and they may be increasing in the current climate. The Chinese-run Asian Infrastructure Investment Bank (AIIB), a newly created institution that supports the Initiative, gives nations feuding over trade with the U.S. an alternative to Western-led international financial institutions. Despite opposition from Washington, Canada applied to join the Bank in 2017, and it was approved this March. Among world’s top 25 economies, Japan, Mexico, and the U.S. are the only three non-members, but the recent presidential election in Mexico may change that list. 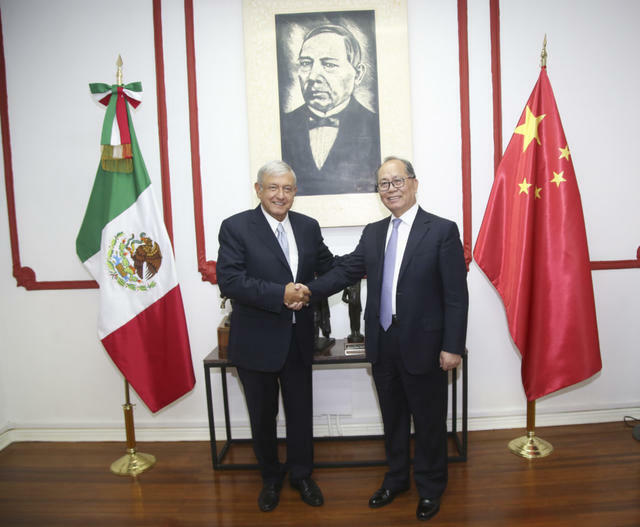 Mexican President-elect Andrés Manuel López Obrador (left) meets Chinese Ambassador to Mexico Qiu Xiaoqi in Mexico City, August 2, 2018. Andrés Manuel López Obrador, the incoming president of Mexico, envisions the construction of a railway corridor across an isthmus in the south of the country that would work like a mini Panama Canal, linking the Pacific and Atlantic Oceans. His economic adviser, Gerardo Esquivel, says China “will surely want to invest” in the Belt-and-Road-style project. López Obrador has also stated his intention to join the AIIB. On August 2, he and members of his incoming cabinet met with China’s ambassador to discuss trade and investment. For China, Mexican involvement in the Belt and Road is not just about North America either; Xi was quoted as saying in September 2017 that the country is an “important pivot of the natural extension of Belt and Road construction in Latin America,” a region where Chinese interest has been conspicuous in recent years. The rise of the Initiative has coincided with President Trump’s rejection of the Trans-Pacific Partnership, which was a key feature of the Obama administration’s “Asia pivot.” In geopolitical terms, what was in large part a Chinese response to U.S. policy has become a proactive project, with Beijing aiming to pick up speed. Belt and Road’s potential to shift global power dynamics is especially worrying at a time when the United States is lessening its leadership on the world stage. But back to NAFTA and North American tariff headaches. While Canada and Mexico may be more compelled than ever to diversify their trading bases, there is little doubt that they would prefer to mend ties with their neighbor in the middle (which is still the world’s top economy) and reach a beneficial new deal. The deep, geography-enabled links between the three North American countries amount to a prime example of what economists call “path dependence,” the tendency to maintain established relationships and practices. This is not a situation where China can easily replace the United States, even if it does make significant gains. However, in looking for leverage in the ongoing negotiations, both Canada and Mexico could well use the “China card” if they choose, pointing out the potential opening for Beijing in the context of its broad geo-economic and geopolitical ambitions. That same card could also be flipped, with China assuming the role of a shared concern; as the Chinese article on NAFTA strategy notes, there are many Chinese products and manufacturing parts, such as auto parts and intermediate textile goods, that are exported to Canada and Mexico before reaching their final destination in the U.S., and an updated deal could include continental agreement on higher tariffs for such items. Indeed, there are many roles that China is playing in the still-unfinished script of the North American trade drama. The controversial first line of that drama, of course, was written by Trump: “Make America great again.” Ironically, the phrase is nearly identical to Xi’s vision of “realizing the great rejuvenation of the Chinese nation.” Both men are taking action, allegedly toward those respective ends, but in highly disparate ways: While Trump’s behaviors have been described as nationalistic and anti-globalization, Xi has portrayed himself as a champion of globalization. For Trump, bringing manufacturing jobs back to the United States is a major part of restoring that “greatness,” and Canada, Mexico, and China stand in the way. China seeks “rejuvenation” in large part by pursuing bold economic and economic-political moves around the world. These convergences, as well as these divergences, have now met in North America. Zheng Wang (@ZhengWangSHU) is the director of the Center for Peace and Conflict Studies and a professor in the School of Diplomacy and International Relations at Seton Hall University. He is a global fellow at the Wilson Center’s Kissinger Institute on China and the United States. Andrew Ludwig is a junior fellow at the Center for Peace and Conflict Studies in the School of Diplomacy and International Relations at Seton Hall University. His research focuses on U.S.-China relations and security in the Asia-Pacific region.